Happy Tuesday, folks. Bob Toben sent me another great comic and my wife thought this one was really good. 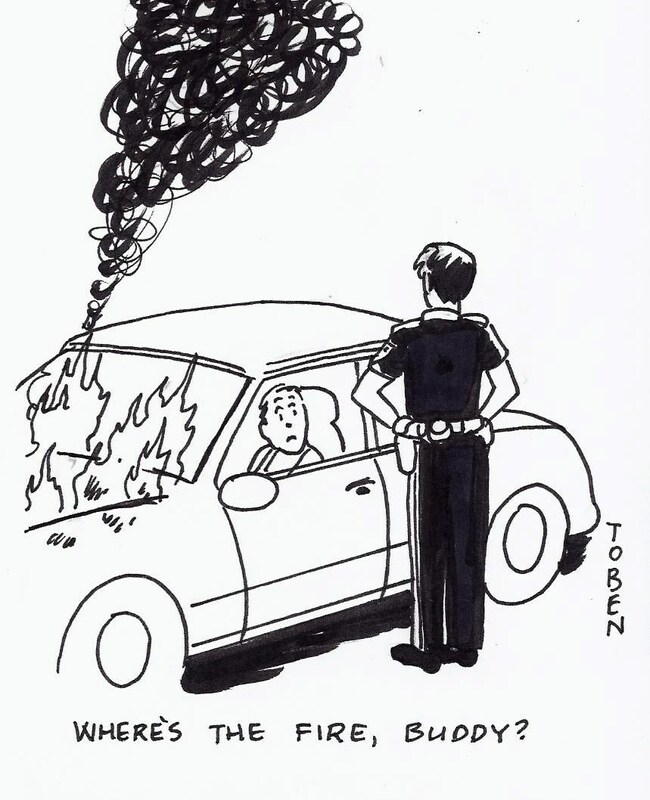 One morning, my wife was driving to class and her car started smoking from under the hood. She pulled over at the local police station to call for assistance. As she was standing away from her car trying to call someone, people were saying, "You can't park there." They wanted her to move her car with a whole bunch of smoke pouring out from under the hood. Nice. So what song have I selected for today's strip? I selected 'I Fought The Law' by The Bobby Fuller Four. This is a classic and Bobby Fuller's death is still shrouded in mystery. There were rumors that Bobby had made some dangerous enemies and although his death was ruled a suicide there was evidence that he may had been forced to ingest gasoline.